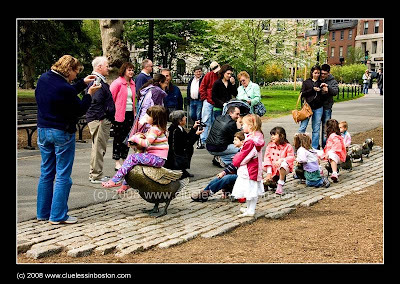 Parents and their children crowded around the most popular attraction in the Public Garden, the Make Way for Duckling statues near the Charles Street entrance. Oh my this is nice. And they are all lined up in a row just like in real life. No wonder the children like the place. I posted a picture of my furry mother for Mother's Day. She was so special we considered her part of our family. Will these ducklings grow up to become swan boats? The perspective in the other photo is neat! Kids love ducks, real or not! Love the candid shot! I love "Make Way for Ducklings"! I think those statues are very cool and a great choice for Mother's Day!! I love these statues! I have a picture of my husband and I there when we were on our honeymoon in 2003. I like this shot!